Cost is the biggest complaint with PACER. It currently costs a user $0.10 per page to pull a court document off of Pacer, with a maximum per document cap at $3.00. The political and philosophical argument is court documents aren’t copyrightable, and are in the public domain. So, PACER-anti-cost advocates ask why do members of the public have to pay to access federal court documents? Lower volume users, those who access less than $15 worth of a material in a quarter, however, are not charged. The argument for recouping cost: running PACER must be really expensive. Again, every federal district, appellate, and bankruptcy court is on this system, so it’s not hard to fathom the giant IT staff and hardware requirements of PACER. However, PACER-anti-cost advocates often cite a Judiciary Information Technology Fund annual report showing the department that oversees PACER had a $150 million budgetary excess in 2006. With that said, more recent budgets show no surpluses among the Judiciary Information Technology Fund’s balance sheet (.pdf page 60 of the Fiscal Year 2015 Appendix Budget of the U.S. Government). 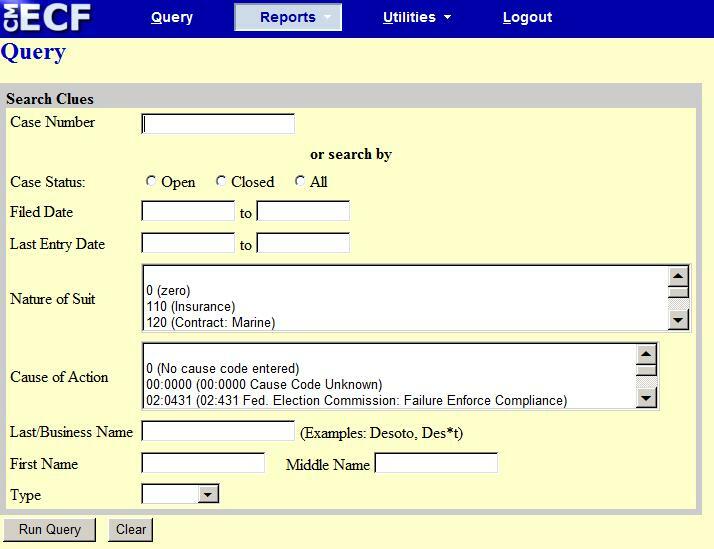 If you have a party, and the correct court, searching within that specific court’s PACER interface can be maddening. The reason why: the party role of the search will be displayed first. 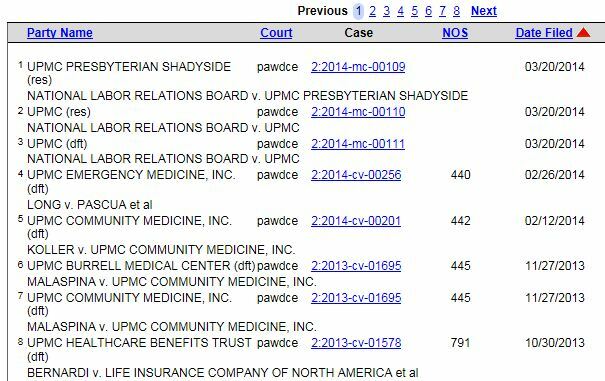 Here’s an example search for UPMC, showing 7 events with UPMC in 7 different roles (counter-claimant, counter-defendant, etc.). 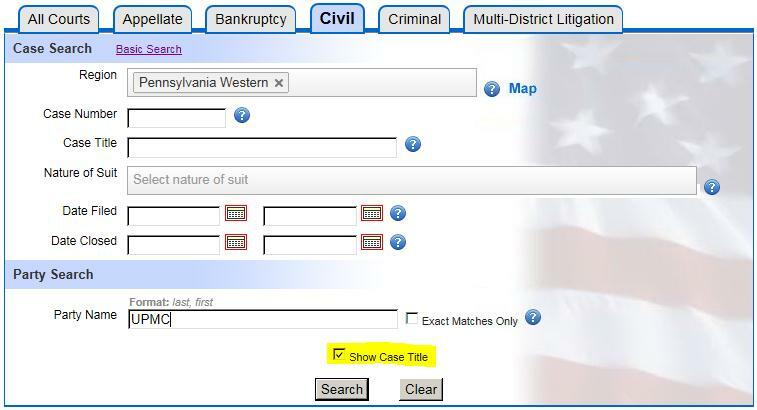 To avoid this confusing, intermediate step, my recommendation is to use the PACER case locator–even if you know what court your case is filed in. Hint: make sure to select “show case title”. The PACER databases contain all of the docket text for every federal case, yet there is no way to conduct full text docket searching in PACER. Users attempting to do this must use a, typically subscription-based, third party research interface (Bloomberg Law, Lexis, Westlaw, and others). Given PACER has the underlying content, it would be such a boon to users if a search engine were implemented over the top of docket text. Currently, most PACER courts have only party name, docket number, nature of suit, and cause of action searching–if users are interested in finding example motions filed before a specific judge, or rule 7.1 disclosures on a particular company, or maybe affidavits filed by an expert witness they would have to turn to a third-party service. Are you interested in thriftily finding out what the latest 3 filings are in a case—don’t forget to uncheck the auto-selected “Parties and counsel” and “Terminated parties” because you will be charged for the docket pages associated with this top matter. This criteria is automatically selected, and of course, costs $0.10 a page, and for multi-party cases with large litigation teams, this can quickly number many pages. Pacer requires case number searches to specifically be in this format: year-dash-court-dash-docket number (for example: 14-cv-52), or yearNoSpaceCourtNoSpaceDocketNumber (14cv52). Any deviation of this causes wonky mis-formatting to happen. The Supreme Court does not use the PACER interface every other federal court uses; it has its own unique system where decisions are available, but you will have to scour SCOTUSblog and other resources for briefing and petitions for writ of certiori. Why is the Court of Last Resort on an entirely different system? 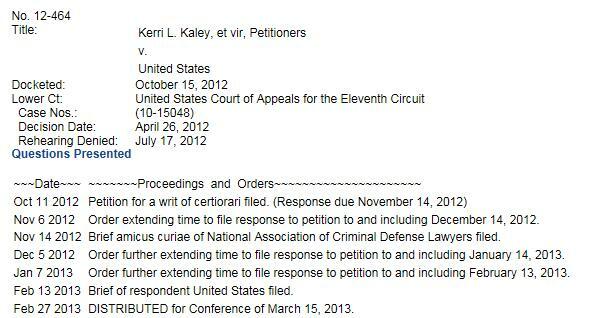 And why are Supreme Court documents electronically unavailable directly from the court? Again, having access to all federal court dockets and documents is a huge benefit, but clearly PACER is antiquated and could better serve its users through some overdue updates to its interface. This entry was posted in Soapbox and tagged Appellate Courts, Court Documents, District Courts, Dockets, Judiciary Information Technology Fund, PACER, SCOTUS, SCOTUSblog, Supreme Court of the United States. Bookmark the permalink. I have been around since PACER began in the mid 1990s. What we have today is light years beyond calling cranky court clerks and waiting for snail mail. But in a partisan political climate where judicial appointments are held up for years, Congress actually tries to eliminate judgeships, and with budget cutbacks at every level, I’m not surprised PACER can’t do more. Government austerity has carved away at our justice system and this is but one consequence. 10-cents per page is worth it to have anything resembling free access. Thanks for your comment, Bunnie Watson, but, to me, cost to access isn’t as much the issue as the difficulties and inefficiencies in the interface used to access. The PACER UI is antiquated, outdated, and doesn’t exploit the potential of the content set it rests on top of; I would even argue that if it were updated, it could be a cost-saver for users. And, again, I agree PACER is better than nothing, and, from having to deal with state courts, it’s much better than a loooot of those places–I am thankful for the existence of PACER, but think it’s way overdue for some major retooling. In my experience, the formatting requirements for cause numbers are really not that perilous when compared to the various state court docket systems out there! I always encourage users to just enter numbers and dashes–less room for error. “14-52” would still get results with the example you gave. The system will then give you selections to choose from (various civil/criminal numbers). Agreed, there are some terrible state court systems out there, but I’m not a fan of user interfaces where you have to sit down and memorize all the various idiosyncrasies associated with the interface, that’s a sign of bad design to me.